We’re all familiar with drinks can recycling. Most councils in the UK offer a household collection service and the recycling rate for aluminium cans in 2017 hit its highest level ever, at 72%. This figure is set to rise further as recycling becomes the norm not just at home, but at work and ‘on the go’ as well. Foil trays – ready meals, quiche and pie trays and pet food trays: Please empty and rinse them (a dunk in the washing up bowl should be sufficient) or wipe them clean before recycling . Aerosols – deodorant, hair care and shaving products and air fresheners: Please ensure they are empty and do not squash or pierce them. You can also remove the plastic lid if it easy to do so, but this is not essential. Bottle tops – aluminium screw caps, found on bottles of wines, spirits and cooking ingredients: Please screw them back on the empty bottle before recycling in a bottle bank or your kerbside system – depending on your Council service. Wrapping foil – used for cooking/sandwich wrapping, please make sure the foil is wiped clean and free from most food residue. Most councils now collect all of these materials for recycling, either as part of a regular household kerbside collection or through ‘bring’ banks, like the ones you may have seen at the supermarket. If you visit your local council website it will detail which materials are collected from your doorstep and which ones are collected through banks (it should also direct you to your nearest ‘bring’ bank). Alternatively, you can enter your postcode at the Recycle Now website to find out which materials you can recycle from home and where recycling banks are located in your area. Some other types of aluminium packaging are not always collected by local authorities, this includes coffee capsules (e.g. Nespresso). Some items that appear to be aluminium are bonded or laminated with other materials, e.g. paper or plastic used in some wraps, cartons and medical packaging. At the moment the technology to recycle these ‘composite’ packs isn’t available, or isn’t commercially viable; but where this material ends up in an energy from waste plant the aluminium can be extracted from the bottom ash and recycled again. In the case of coffee capsules, Alupro has supported Nespresso who have established their own recycling system in the UK. Find out more here. 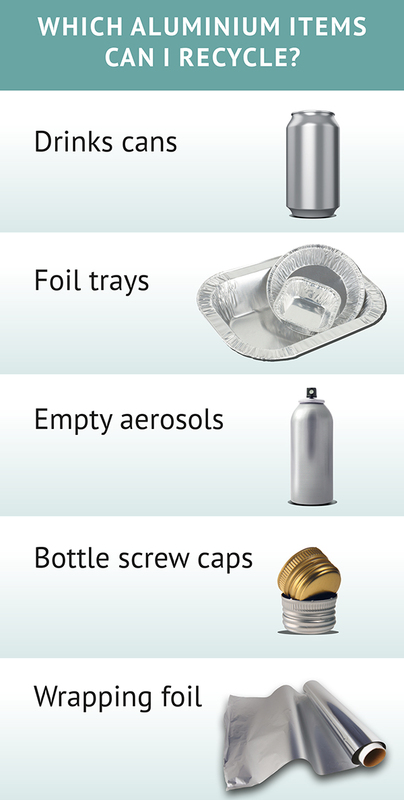 All aluminium is endlessly recyclable but not all types can be collected from the kerbside. Please take any other aluminium items to be recycled at your local household recycling centre (HWRC or ‘the tip’) such as bikes, garden tools, pots/pans and empty paint tins. Click here to find your local centre. Not all packaging that looks like aluminium foil actually is – some wrappers and crisp packets are actually metallised plastic film and cannot be recycled as foil. Scrunch the foil in your hand – if it stays squashed in a ball it is foil and can be added to your recycling. If it bounces back open it is plastic and needs to go in the rubbish bin. Please rinse foil trays before recycling to remove food residue. This reduces smells and prevents other materials in the recycling becoming contaminated and attracting pests. To save water trays can be rinsed at the end of the washing up. Only recycle empty, used up aerosols. Do not attempt to pierce or squash them. If you can, remove the plastic cap and nozzle; but this is not essential.